The Eselfontein mountain bike singletrack is legendary. Tucked away at the end of a dusty road up in the mountains of Ceres lies this little piece of singletrack heaven. 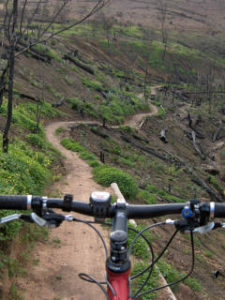 The annual mountain biking festival is what has made this mountain bike trail destination so popular. 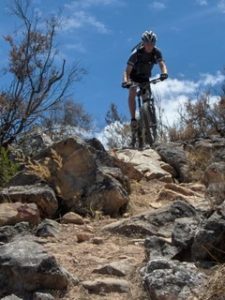 A full weekend of mountain biking with various short and long rides makes this a favourite on the Western Cape MTB calendar. Eselfontein has been on my to ride list for a long time but I have just never managed to get to the festival or any other time for that matter. So when the e-mail landed in my mail box just after Christmas saying, “we are planning to ride Eselfontein” I took the gap. It was mid summer, not the best time at all, but I had to go. 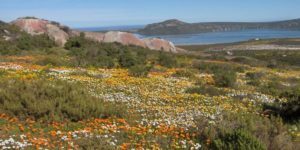 It is pretty much a two hour trip from most places in and around the Cape Town area. Luckily the weather gods had sent some cooler weather in the form a cold front, but a gale force southeaster made the ride quite challenging at times. I met up with some singletrack slaves from Stellenbosh riding plush trail bikes versus my cross country race kitted full susser. I knew I was in for trouble when I saw them disappear down the first singletrack downhill, as I hung on the back with every bit of technical riding skill that I could find. We didn’t follow the route markings, which seemed to be well placed, instead we took advantage of some local knowledge and did most of the route backwards. It took us a while to get to the singletrack through the orchards and a couple of us wondered what all the fuss was about. Paul assured us that by the end of the day we would have had singletrack overload and be happy when it eventually stopped. Well once we hit the track it didn’ t stop. The dry summer season made the track quite loose so you had to hold back on the corners a bit to avoid sliding out. The first section followed the river, cris-crossing it and winding through the small rocks. This lead us up to one of the many named sections called Shapiros Folley. Normally done in the opposite direction, this was the start of a stiff climb with some tricky technical sections taking us up to the highest point and past one of the many picture perfect mountain lakes. Then we came down some sections called Dead man walking and Red bull hill, both of which are normally long uphill slogs, but now they were downhill singletrack, an absolute pleasure. We had been riding for almost 3 hours and it was almost all on singletrack. It was good going with ample stops to catch up and reflect on the last section completed as well as just talk general bike stuff as we looked our over magnificent vistas. We passed Phillips creek and headed towards Death Drop. This was a technical climb followed by a technical singletrack decent with some awesome views over the valley and the farm. This must rate as one of the best pieces of singletrack that I have ridden, the first section is technical with a nice gradient and then the last piece is fast and flowing, a great combination in one section. We then started to make our way back but first we had to sample some more of Eselfontein’s finest as we headed for one of the sections we had climbed up, this time to do it properly as a downhill. This lead us into the forest section which followed the river all the way back to the farm. 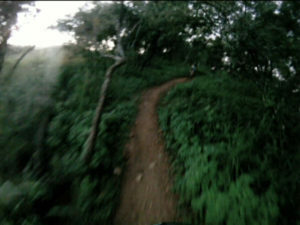 This too was a gem of singletrack in amongst the trees on nice firm damp ground. We had been out for over 4 hours and just before we emerged from the singletrack and I had my second meeting with the ground for the day, I thought ok enough singletrack now, it had been over 60km of absolute bliss. What a great days riding but that is what I had expected from the legendry Eselfontein. It has truly lived up to its name and fame. It is a place where you can go back to many times because you will always find something new and interesting. 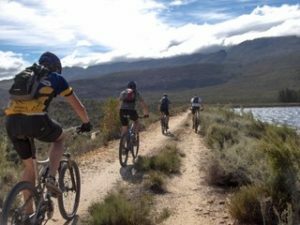 With the recent addition of a guesthouse on the farm property, in addition to the Eco Huts, visitors are always welcome to enjoy mountain biking at its purest on some of the best and definitely the longest singletrack around.